Grass Tetany is primarily a magnesium deficiency disease of cattle and sheep that causes incoordination, muscular tremors and even death. It is sometimes known as wheat pasture poisoning or grass staggers because frequently it affects animals grazing wheat pastures or lush growing grass. Each year it affects about 1% of cows in the United States and is responsible for a large number of cow deaths. Cows are especially susceptible shortly after calving and while nursing calves less than 2 months of age. 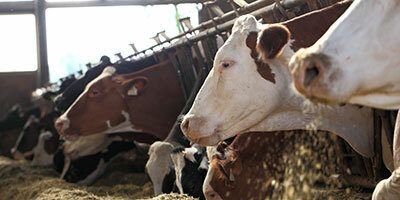 Older cows and high milk producers are very susceptible. Tetany is most common during spring calving, a time when grass pastures are growing rapidly and forage is lush. Also it can occur during the fall grazing or in winter when cows are consuming grass hay. In mild cases, milk yield is decreased and animals are nervous. In more severe cases, affected animals may walk with a stiff gate, avoid the rest of the herd and lose their appetite. They are nervous and keep the head and ears erect. They may stagger, have twitching skin on face, ears and flanks and lie down and get up frequently. In the most severe stage, animals collapse with muscle spasms, or tetany. Death occurs at this stage unless immediate treatment is given. The major cause of grass tetany is a deficiency of available magnesium (Mg). Usually, this results from a deficiency of Mg in the forage or in the animal's ability to utilize it. Other factors can affect Mg utilization, and thus grass tetany. Frequently, forages contain high levels of potassium (K) which interferes with the absorption of Mg into the blood. Other dietary factors include deficiencies or imbalances of other nutrients. Heavy fertilizer application of potash (potassium), nitrogen (N), and sulfur (S) also can interfere with the uptake of Mg into the plant while increasing its K content, creating a mineral imbalance in the animal consuming the forage. Animals diagnosed with grass tetany should be treated by a veterinarian or as advised by a veterinarian. Treatment usually involves administering a soluble Mg source IV, under the skin or by enema. Feeding a high-magnesium mineral supplement is one of the most effective aids in prevention of grass tetany. Magnesium oxide (MgO) is the most concentrated and, usually the most economical source of Mg for use in mineral supplements. Care should be taken to assure adequate mineral consumption, since high-Mg minerals can be relatively unpalatable. Ingredients such as dried molasses and grains can improve the palatability of the mineral mix. The recommended amount of supplemental magnesium for best protection against grass tetany in adult cattle is provided by 2oz. MAGOX® DAILY. Please see the following chart for more detail.